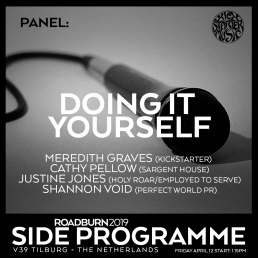 This panel discussion will seek to demystify the process of getting your music out into the world, with or without a label. It’s time to bin the adage that it’s ‘not what you know, it’s who you know’. This panel seeks to arm you with what you really need to know about releasing music on your terms. The options for self-releasing are more diverse and available than ever, so how do you get started in a world that is often overwhelming? And should you prefer to navigate the choppy waters of seeking a label, how on earth do you get your foot in the door? We’ll also look at where those two worlds overlap – and how some of your favourite labels utilise the exact same resources that you would do if you go it alone. We have gathered together some of the finest minds in the music industry to give you some valuable insight – and absolutely zero platitudes. Come for the pep talk, stay for the wisdom! Joining the panel will be: Meredith Graves (Kickstarter), Cathy Pellow (Sargent House), Justine Jones (Holy Roar, Employed To Serve), Shannon Ward (Perfect World PR).